Researchers have drawn inspiration from nature over the years as it offers many different materials for innovations. The molecule of the heritage or DNA is one such material, with its exceptional self-assembling properties. Recently, a team of researchers at the Nanoscience Center (NSC) of the University of Jyväskylä and BioMediTech (BMT) of the University of Tampere have demonstrated a technique to fabricate electronic devices using DNA. The DNA does not have a part in the electrical task, but serves as a scaffold for developing a linear, pearl-necklace-like nanostructure made up of three gold nanoparticles. Electrical conduction in nanoscale materials can vary greatly from standard, macroscale metallic structures, which have innumerable free electrons forming the current, making any effect by a single electron unimportant. However, even the inclusion of a single electron into a nanoscale piece of metal can enhance its energy adequately to stop conduction. This sort of inclusion of electrons typically happens via a quantum-mechanical effect known as tunneling, where electrons tunnel via an energy obstacle. In this study, the electrons tunneled from the electrode linked to a voltage source, to the first nanoparticle and then moved onto the next particle and so on, via the gaps between them. 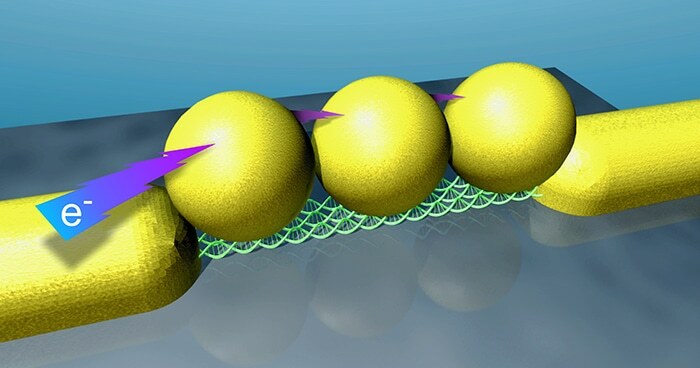 Such single-electron devices have been fabricated within the scale of tens of nanometres by using conventional micro- and nanofabrication methods for more than two decades. The weakness of these structures has been the cryogenic temperatures needed for them to work. Usually, the operation temperature of these devices scales up as the size of the components decreases. Our ultimate aim is to have the devices working at room temperature, which is hardly possible for conventional nanofabrication methods – so new venues need to be found. Toppari studied these structures earlier in his PhD work. Current nanotechnology offers tools to fabricate metallic nanoparticles measuring just a few nanometers in size. Single-electron devices fabricated using these metallic nanoparticles could operate right up to room temperature. The NSC has years of experience in fabricating such nanoparticles. After fabrication, the nanoparticles float in an aqueous solution and need to be organised into the desired form and connected to the auxiliary circuitry. DNA-based self-assembly together with its ability to be linked with nanoparticles offer a very suitable toolkit for this purpose. Gold nanoparticles are attached directly onto a DNA structure (designed and analyzed earlier by the involved groups) within the aqueous solution. The entire process is based on DNA self-assembly, and produces innumerable structures inside a single patch. In order for measurements by electric fields, the ready structures have are further trapped. The superior self-assembly properties of the DNA, together with its mature fabrication and modification techniques, offer a vast variety of possibilities. Electrical measurements performed in this research revealed for the first time that these scalable fabrication techniques centered on DNA self-assembly can be efficiently applied to fabricate single-electron devices that operate at room temperature. The research is based on a long-term multidisciplinary partnership between the research groups involved. The Academy of Finland funded the research. Besides the persons mentioned above, Dr Jenni Leppiniemi (BMT), Boxuan Shen (NSC), and Dr Wolfgang Fritzsche (IPHT, Jena, Germany) also contributed to the research. The research was published on 13 October 2016 in Nano Letters. Collaborative travel funding was provided by DAAD in Germany.